9 February 1922 - 27 August 2014. This site is dedicated to all "Who went down to the sea in ships" in World War 2, in whatever capacity they may have served the cause of freedom, but especially to the Eighty Four Officers and Men who died in H.M.A.S. Canberra at the Battle of Savo Island, on the 9th of August, 1942. There are Should you wish to post a Tribute to Mac, or to make any comments, please send emails to: ahoy.weblog@gmail.com. Here are the latest 12 articles. See the article list, letters archive, or site map to see all of them or to get your bearings. Links to the main features are in the right hand column. If you can't find what you are looking for, try this search page. There is also a search link on each page. Sadly Mac did not live to see his dream materialise. But he would no doubt have been delighted that the statue has been erected as he envisaged many years ago, on the foreshore at Port Melbourne looking out at the entry to Port Phillip Bay, the point from where as a young midshipman he left for WW II and from where his ashes were scattered on 3 September 2014, on the outgoing tide. Read the article. 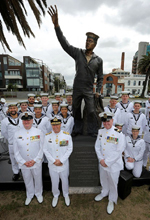 Visitors to Ahoy will be pleased to know that Mac’s long held dream to erect a bronze commemorative statue of a World War II sailor “Answering the Call” is to be unveiled by Vice Admiral Tim Barrett AO CSC RAN Chief of Navy and Patron of the Naval Heritage Foundation of Australia Inc. Read the article. I am honoured to have known you a little Mac, and I am thinking of you and your family. RIP with your fellow shipmates. I salute you Mac. Read the article. I am so sorry that this consummate gentleman has died and Mac was an inspiration to my late Father, to myself and many more. Read the article. 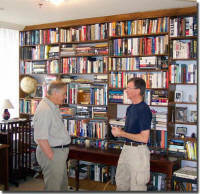 I met Mac back in 2009 when I was doing the early research prep on work for a biography of CPO Ray Parkin - HMAS Perth. Read the article. I served aboard USS Canberra from 1966 through 1968, and was lucky enough to visit Melbourne on her cruise there. Best ship I was ever assigned! Read the article. He had an interest in HMS Pathfinder and had contacted the Queensferry History Group. I wrote and asked him about the convoy RB1 which sailed from USA and England, he published the article I sent. Read the article. • Best way to reach me is via e-mail. I answer all queries. * 20 April 2015 - Letters: Gerald Hutchinson, oldest living survivor of SS Athenia? History and Parts of the Submarine. "The Dear Surprise" website is dedicated to Patrick O’Brian’s epic Aubrey/Maturin series.